Six Black Watch soldiers lost their lives on August 28, 1944 while liberating the village of Mauny. A French village has unveiled a memorial to six Black Watch soldiers killed during its liberation in the Second World War 69 years ago. Residents from Mauny in Normandy had decided to pay tribute to the six men who lost their lives on August 28, 1944. The ceremony on Saturday was attended by Dr Tom Renouf, an 88-year-old Black Watch veteran who was injured in the fighting, and relatives of Private George Hildred, the youngest of the six who died. The village was liberated 12 weeks after Allied forces invaded Nazi-occupied Europe on June 6, 1944. After the initial success of D-day, British, American and Canadian forces became bogged down in ferocious fighting with German forces. Estimates vary but it is thought nearly 500,000 men from both sides were killed or wounded during the 12 week-long Battle of Normandy. 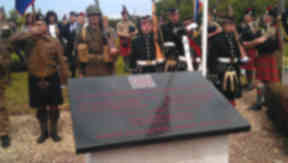 The plaque unveiled at Mauny was placed beside the village's own tribute to its men who died during the First World War. The stone memorial is still pocked with bullet holes from the fighting in 1944. Dr Renouf, from Musselburgh, said: "The French have done a magnificent job. I've attended many ceremonies over the years but this was the best by far." For Private Hildred's niece Jacqui Scales, from York, it was a highly emotional day. She said: "My dad died earlier this year and he would loved to have been here. He never forgot his brother." George Hildred lied about his age and occupation to join the Army. He suffered a fatal bullet wound as the Black Watch tried to take the chateau in Mauny. The other Black Watch soldiers named on the new memorial were Major Donald Mirielees, Sergeant Thomas Kirkcaldy, Lance Corporal Harry Billington, Corporal James O'Keefe and Corporal Harry Chapman.